So, in StreetPass Mii Plaza, there are two games, StreetPass Quest and Puzzle Swap. What brought those about? 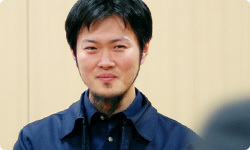 To begin with, when we were thinking of applications for the Nintendo DSi system, Akifusa-san had an idea for a project called Travelling Mii. Ah, yes, I remember that. It involved Mii characters that adventured through StreetPass. The Nintendo DSi system didn't have the constant StreetPass function, though, so we thought it would be a bit too hard to realise, and the idea was shelved. But since the Nintendo 3DS system can use StreetPass all the time, you thought the Travelling Mii idea might play very well on it. That's right. Then, on the Mii Channel for the Wii console, there's a place called Mii Parade, where Mii characters you've met via Nintendo Wi-Fi Connection and Mii characters that came in through the Wii Remote controller sort of gather. Someone wondered if we couldn't use that somehow, so we mixed the two together, and it turned into StreetPass Mii Plaza. The Travelling Mii idea originally came about during the development of the Nintendo DSi system, so that would have been around 2007. Would that be our corporate culture of not giving up? (laughs) The 3D itself is like that, too. Then we've still got a ways to go. As the one who proposed the project, you're quite satisfied. You've also made it possible to send and receive messages through StreetPass. How did you hit on that idea? First, we experimented with StreetPass inside the group. Some said that, if Mii characters just showed up, it wasn't easy to see the differences between them. So we made it so that you can enter greetings, so that they can talk when they meet. No, you can't. There's a mechanism that makes it hard to enter personal information or messages that will make the receiver feel bad. That said, it's pretty fun to watch Mii characters talk. We've left the content of the greeting up to the players. By making it so that every Mii character has an absolutely different greeting, I think each individual Mii character stands out more. If you have StreetPass with the same Mii character several times, you can also set a personal greeting, meant just for that Mii character. Yes. When we were experimenting with greetings as a group, lots of us thought it would be fun to be able to return greetings. So we made it so that, if you have StreetPass with the same Mii character twice, you're asked if you want to greet them personally, and you're able to use a personal greeting just for that Mii character. Once you've entered a personal greeting, the next time you have StreetPass with them, that's the one that will get sent. So, you can sort of correspond with people you've never met. Yes. The messages are short, but you can. 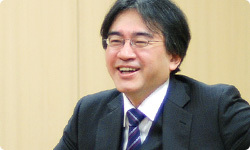 Um… I actually got a personal greeting from Iwata-san. I'd asked for Mizuki-san's help on an important job, so I wrote that as my personal greeting. Even just thinking about things like that is pretty fun. We tried to make it so that you can see when someone had StreetPass with you, and imagine all sorts of things. Besides that, when I see people in the company acting in different ways, because they want to make their Mii characters have new StreetPass data in StreetPass Mii Plaza, I feel a lot of potential there. In our group, there are lots of people who like to use StreetPass Mii Plaza, and try to make sure lots of Mii characters gather there. In that sense, too, StreetPass Mii Plaza does feel like a real Tomodachi Collection. All right, next I'd like to talk about Nintendo 3DS Camera. Akifusa-san, what was on your mind when you developed this function? First, I wanted to actually experience what it would be like to take a 3D photo, and at first I was honestly surprised. Then… how should I put this? Before all else, I wanted to make something that people would use for five or ten years. That's a pretty tall order. But I think, even five years from now, people will be impressed by 3D photos. You're right. The photos taken with Nintendo 3DS Camera feel incredibly real, so you want to save them. Still, even though the 3D startled me, I thought I'd rather not coast on that borrowed momentum. Um… Actually, I've got a photo I don't want to delete. I snapped it during a fairly sombre meeting, which I'm not proud of, but everybody's drooping, and it really did capture the feel of the place. The 3D does bring out the atmosphere. Wouldn't it be safer to delete it, though? Well… You think so, too?